To prepare the sauce, first smash the cloves of garlic using the side of a chef’s knife. In a medium pot, add the garlic, miso, tamari and water and whisk to combine. Then add the peppercorns, dried mushrooms and seaweed. *Note: Seaweed can be found in most Asian markets and in many health food stores. Bring the mixture to a boil, then turn down the heat and let simmer for 20 minutes. At this point, strain the liquid and return it to the pot. Let simmer again for another 20 minutes, or until the liquid has reduced a bit and is almost too salty. If you have ever tasted regular fish sauce, you will know that it is super salty (and fishy), yet when used in a dish, it adds just the right balance of salty/fishy depth—otherwise known as “umami.” Essentially, that is what you are going for here. Once done, remove from the heat and let cool. Then place into a glass container and refrigerate. Use 1:1 wherever a recipe calls for regular fish sauce. 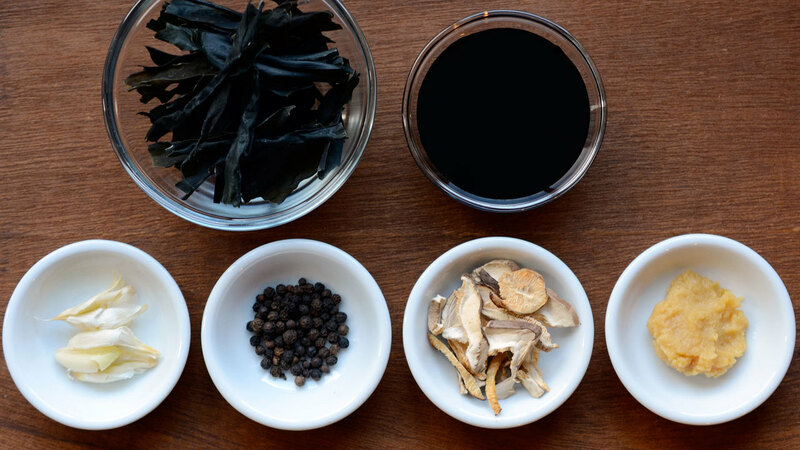 For a thicker, no-cook sauce this Fermented Black Bean Fish-Less Fish Sauce is also really good. Besides the ingredients used, the other difference is that this fish-less sauce is not cooked and it will keep for a bit longer. Love this recipe! How long can I keep it in the fridge? Does anyone have a fish-less eel sauce recipe? Hi Alex- This sauce has a very long shelf life given it's high salt content. It will easily last 6-12 months in the refrigerator. As for the fish-less eel sauce recipe? I have not seen one. I just found a great fish-less eel sauce recipe and it couldn't be simpler. It's equal parts sugar, soy sauce, and mirin. Reduce it until its the desired consistency and viola! Just remember to reduce over low heat because it can burn due to the high sugar content. This will last a while in the fridge. Thanks for sharing Alex! Keep up the good work and thanks again for Cooking with Rouxbe. anyone knows how much dried mushrooms i should add? ?